I’ve seen a lot of web celebs ask for a vote and to that I say, hey, why don’t you vote for a regular, hardworking guy? Is there a leader board somewhere? The Beat Dolls deserve to win this because they would be a great spokesperson for about.me. What better way to show what this website can do and how it can be utilized than for an indie punk band from Austin, TX just chasing the dream. However, the reason why they deserve to win is because they have been fighting for 5 years to claim respect, notoriety, and spread their love of rock–oh and by the way, the creator, songwriter, guitar player and lead singer is female–something that is rare these days. Support local music and vote for The Beat Dolls. They won’t ever give up to be heard and a hard-working band who deserve a break! No there isn’t. 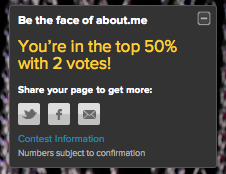 You can see where you rank within 5% on your own page however. Vote for me please ! The idea is really great ! I created 2 websites, a facebook page and on my way to creating a you tube. I do not support a particular cause but I do represent a witty new York college student who does more volunteer work than actual paid work. Also, I keep hearing that you can have anything you want if you put you’re entire energy towards it… i’m here to see if that concept is right. should I dare say… vote for me? At least let’s vote for each other other than the celeb’s. This is our time. This is our turn! is the top 5% the highest ranking you will see or is there a way to know if you are in the top 1%? You are right, it is never to late to correct a problem. However, instead of just pointing out a problem, how do you suggest this problem to be fixed? Or……..dont apply the vote botton on the profile out af America. What a great idea! I would sincerely appreciate your Votes. ~ I’m promoting Animal Rescue, a cause I’m quite passionate about. you say you’re promoting animal rescue but the only place on your page that you mention animals in on the very top when you are asking for votes. The rest of your page you are promoting your self and your work. It is fine to promote yourself. but it is not ok to say that you promote a cause when in fact you don’t. Looks like you are only saying that in order to get votes. I’ll appreciate it if you kept it real. If you said “vote for me cause i’m a social media consultant with many years of experience” i would have voted for you. because then you would have been honest. you are not honest and do not deserve votes. This contest is so much fun! I am really connecting with my fans and getting them involved through this! Please check out my page and vote for me! http://www.brookewoods.com !